Guests try their hands at bowling during River City Roll's soft opening. The phrase “boutique bowling alley” may seem counterintuitive. 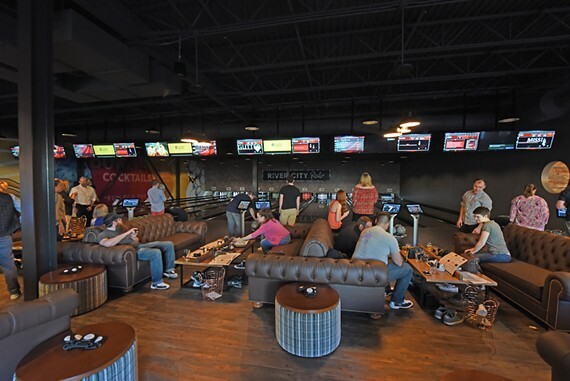 But the trend of putting bowling lanes, an extensive bar and a menu featuring more than hot wings and Bud Light is picking up steam, and it was only a matter of time before it made its way to Richmond. On Thursday, April 12, River City Roll made its debut with a soft opening for friends, family, industry folks and media. Spearheaded by business partners Rob Long and Ben Eubanks, Scott’s Addition’s newest entertainment spot is located at 939 Myers St. It’s a short walk from the neighborhood’s breweries and cideries, which Long says was no accident. 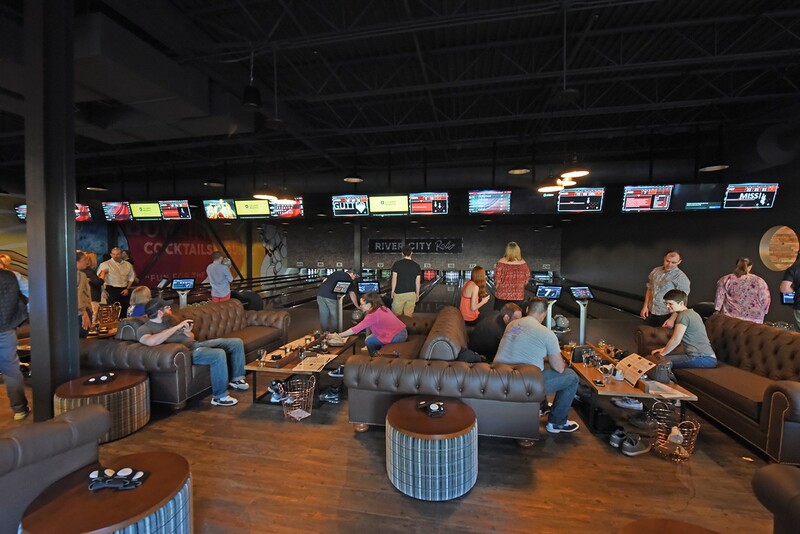 Twenty lanes are available for bowling, each equipped with oversized leather couches for lounging between rounds, plus TVs with individual controls. The screens displaying the scores feature more than numbers in each frame — they’ll also share stats throughout the game, like the average speed of your ball in miles-per-hour. 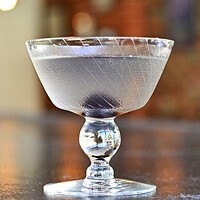 Servers meander from lane-to-lane, taking bar and kitchen orders and even swiping cards right there on the spot. A room next to the two skee-ball machines up front will be available for private events, and groups of as many as 50 or 100 can reserve six or 12 lanes, respectively, for parties. It’s 21 and older from 5 p.m. and later, but Long says he hopes families will take advantage of the space during daytime hours on the weekends. 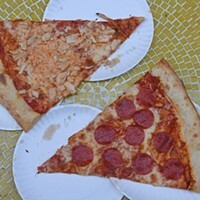 The menu includes a selection of flatbreads and pizzas, which are prepared in the exposed oven right behind the check-in desk, hitting guests with that wood-fired smell as soon as they walk in the door. Sandwiches include a Wagyu beef burger, slow-roasted pork with a sunny-side-up egg, and grilled merguez sausage. For small plates they’ve got salt-and-vinegar chips with cucumber-dill dip, truffle fries, carrot hummus and charred asparagus, and larger dishes include pork tacos, fried chicken and two salads. Former Lemaire sous chef Brad Slemaker runs the kitchen, and he and Long agreed from the beginning that they can and should do more than “just elevating the burger.” Everything on the menu costs less than $15, and they want the food to be both upscale and accessible. Over at the bar, which seats 36, they’re mixing up house cocktails like the Monument Ave Elixir, a bright pink concoction of Cirrus vodka, strawberry-basil cordial, lime, aperol and orange. The draft list features the usual suspects like Hardywood Singel and Bold Rock cider, plus a Belle Isle cocktail (yes, a draft cocktail) and the private-label Roll pilsner, which the brewers over at Vasen Brewing Co. created specifically for River City Roll’s bar. The team is taking a few days to work out the kinks following the soft opening, and will open to the public on Tuesday, April 17. Saturdays 11 a.m. to 2 a.m.